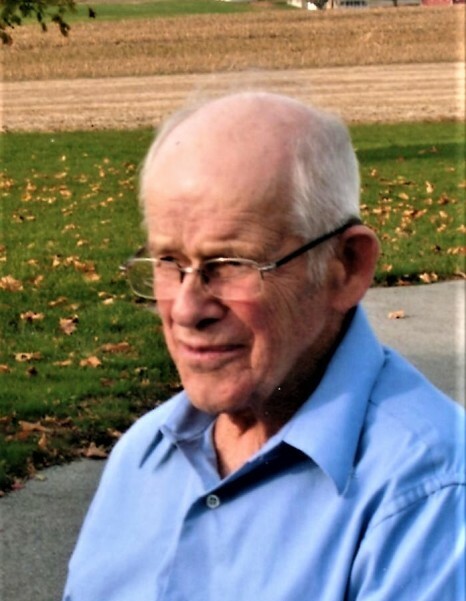 Charles Franklin Hershberger, 88, of rural Martinsburg, Bedford County, passed into the arms of his Savior early Wednesday, January 30, 2019 at his residence. He was born in New Enterprise, PA, son of the late Ross Wilbur Hershberger and Cleo Elizabeth (Detwiler) Hershberger. On August 6, 1949 he married M. Dolores Beach at the Koontz Church of the Brethren, Loysburg, PA. She preceded him in death on April 16, 2010. Surviving are two sons: David C. of Shippensburg, PA and Ross H. (Yvonne) of rural Martinsburg and two daughters: Ellen M. Stuckey (Joseph), Martinsburg and Christine F. Ebersole (Randall) rural Martinsburg. Also surviving are four brothers: George, of Woodbury, PA, Max, of New Enterprise, PA Robert, of Quarryville, PA and Jerry, of New Enterprise and one sister, Lois Kyper, of rural Huntingdon. He had 17 grandchildren; two step grandchildren; 28 great-grandchildren; and 7 step great-grandchildren. He attended Hopewell and Martinsburg Grace Brethren Churches. As a young man he worked for New Enterprise Stone and Lime. He then pursued his life-long passion of dairy and crop farming. He was a graduate of Replogle High School. He had a great interest in carpentry and was also an accomplished mason. He could also solve most mechanical and welding issues that occurred on the farm. Education was very important to Charles. He served 34 years as a School Board Director for Northern Bedford County School District and was a Woodbury Township Supervisor. The farm he owned with his wife of 60 years, Dolores, achieved Dairy of Distinction Status. Visitation will be from 2-4 and 6-8 on Friday, February 1, 2019 and from 10 until the 11 am funeral service, Saturday, February 2, at the Martinsburg Grace Brethren Church, 300 S. Mulberry Street, Martinsburg, PA, Pastors Mark “Cappy” Lingenfelter and Brian L. McCall officiating. Interment will be held at Dry Hill Cemetery, Woodbury.